Weymouth manager Jason Tindall has raided his old club Bournemouth to sign his former team-mate, veteran defender Neil Young, on a month's loan. Young, 34, has just returned from injury himself and will cover for the Terras' injury and suspension problems. He will also be allowed to become cup-tied for Weymouth in the FA Cup. "It is not very often that a club like Weymouth can sign a player of the quality and experience of Neil Young," Tindall told the Dorset Echo. 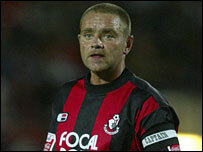 Former Tottenham trainee Young has made 490 appearances in 13 years with Bournemouth since leaving White Hart Lane. He signed a new one-year contract at Dean Court during the summer. Weymouth have also signed former Bournemouth defender Callum Hart, who has been without a club after he was released by the Cherries in May, on non-contract terms.